With the support of the Royal Canadian Legion, Army Cadets Corps from across the country will take part in the various Remembrance day ceremonies and events within their respective communities. It is with their historic military and regimental ties, that Army Cadets have a strong desire to show their support and pay respects on Remembrance Day. Army Cadets are often called upon to participate in a variety of other commemoration events within their communities. Visit your local Army Cadet corps website, the Royal Canadian Legion Branch or community calendars for more details about these ceremonies. Canada’s “coming of age” as a nation. The victory, however, was not without a price. There were more than 10,000 casualties. Of those, 3,598 gave their lives. Ceremonies take place annually on or around Vimy Ridge Day at the National War Memorial in Ottawa, in cities and towns across the country and in some cases, Cadet Corps will travel overseas to visit and attend ceremonies at the Canadian National Vimy Memorial in France. In 2010, Canada marked the “end of an era” on Vimy Ridge Day with the passing of our last First World War Veteran. Youth were challenged to take up the torch of remembrance so that the memory of those who served between 1914 and 1918 would never fade. In 2011 marking the beginning of a new era, The Royal Canadian Army Cadets commemorated the Battle of Vimy Ridge for the first time. Since then, Army Cadets all across Canada rise to the challenge each year to commemorate the anniversary of the Battle. To promote these events the national office created the poster pictured here. Copies of these posters are available upon request. 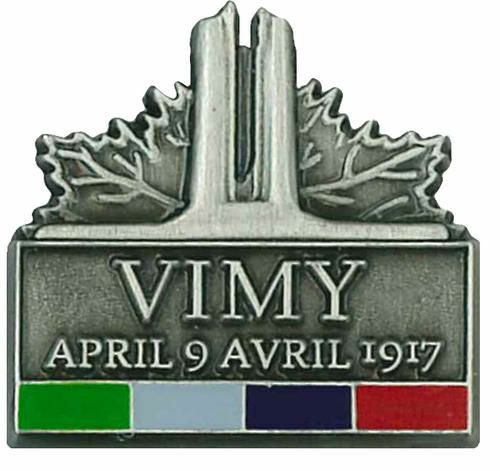 Find out how you can raise funds for you corps with the sale of the Vimy pins. For more information contact the Vimy Foundation at 1 (416) 595-1917, ext 4. ”Vimy Ridge – The Soldiers’ Story” @ $19.96 + shipping handling and taxes = $36.68 CDA. You may also forward your orders to info@mcnabbconnolly.ca. Please specify that you are ordering this items for the use of a cadet corps. You may also ind several historical clips about the Battle of Vimy Ridge on You Tube. By searching You Tube using keywords relating to the Battle you will find many other interesting and educational clips. These t-shirts created for the Army Cadet Vimy Commemoration Events are available to order through our kit shop. The front of the t-shirt was left blank to provide the option for the corps to place their own logos if they wish. The cost is $10.25 for sizes SM- XL and $12.25 for XXL. Click here to order.